Home / Uncategorized / How do you tell a story with data and maps – Beto vs Cruz? How do you tell a story with data and maps – Beto vs Cruz? FiveThirtyEight has an excellent article on the 2018 senate race and the possible implications for future elections. 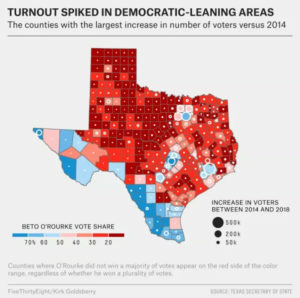 The article, What Really Happened In Texas by Kirk Goldsberry (11/14/18) analyzes voting patterns by county and compares 2014 to 2018. Their graph copied here is the fourth in a series of maps and mostly summarizes the previous maps. Cruz won by 220,000 votes last week. But in Harris County alone, 500,000 more people voted in the 2018 midterms than had voted in 2014. In Dallas County, 300,000 more people voted than in the last midterms, and in Travis, Bexar and Tarrant counties, 200,000 more people voted. Indeed, aside from some noteworthy increase in voter numbers in suburban Dallas, the biggest white circles on the map above tend to hover over Beto country. Meanwhile, the darkest red counties — the places that carried Cruz back to Washington — have exhibited very little, if any, change in the number of votes cast compared to 2014. Those areas may be staunchly red, but they’re also staunchly stagnant too. O’Rourke almost won in 2018 by taking roughly 60 percent of the vote in the big five counties. This map suggests that if Democrats can repeat that feat as these places continue to grow, that may be all they need to turn Texas blue. The data for their analysis comes from the Texas Secretary of State election results. The 2014 data is available by following the Historical Election Results (1992-current) link. The 2018 data is available through a link along the top. This is a stats project in the making (do this for you home state). The article can also be used in a QL course. Previous How does the digital divide impact secondary education for different groups? Next What are the predictions for antimicrobial resistance?